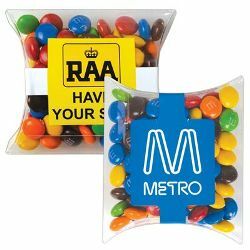 95 grams of milk chocolate M&M's packed in Pillow Pack. Finished weight - 107 grams. ITEM SIZE(MM) 85L x 95H x 28D. PRINT AREA(MM) 4CP Standard Label – Up to 50L x 50H, 45 Diameter, 55L x 30H, 4CP Deluxe Label - Band 15L x 140H & Centre Area up to 50L x 50H (top cut to any shape). LABEL SIZE (MM) Standard Label - 50L x 50H, Round, 45 Diameter, 55L x 30H, Deluxe Die Cut Label (cut to any shape) Band - 15L X 140H.